In this part we will explore the meaning of the Dhyana Shlokas 1 and 2 that we recite before chanting the Sahasranamam. At first sight, this appears to be a complex tongue twister. But once we analyse and understand this simple and beautiful verse, we will begin to appreciate the splendour of the Lord from this Shloka. This describes the majestic view of Sri MahaVishnu in a manner that creates a vivid image that can be etched in our inner vision with ease and serves as a prelude to the Parayanam. In any Sanskrit poem, the clue to understand the meaning lies in identifying the basic subject, predicate and the object. Rest of it is generally embellishment and descriptive clauses that adds colour to the subject, object and the predicate. In this Shloka the basic nucleus is ‘Mukundah nah Puneeyaat’ meaning ‘Let Lord Mukunda purify us’. Mukunda is the name for MahaVishnu meaning ‘the giver of Mukti or Liberation’. Having identified Mukunda as the subject, we can see that all other phrases are merely adjectives describing different aspects of Mukunda. The first description is he is ‘Aasanasthah’ or sitting on a pedestal. Where is he seated? On which pedestal? ‘Shuchimani vilasat saikate’ – on a shining sandy surface studded with pure diamonds; in other oceans the sand only contains silica crystals but on the banks of the Milky Ocean the sand is interspersed with dazzling diamonds. Sri MahaVishnu, is seated on the diamond studded sandy banks of the milky Ocean on a seat adorning a garland of pearls. What more can you say of Him? He is ‘Mouktikair Mandita Angah’. His body is decorated by pearls. ‘Sphatika Mani nibhaihi’ which are luminous like white crystals. He is Aanandee, blissful and joyous. Mukta Peeyoosha varshaihi – pouring torrents of nectar. ShubhraiRabhraiRadabhaihi – From the multitudinous pure white clouds. Upari Virachitaihi – Hovering above the shores like a decorated arch, He is enjoying the showers of nectar pouring out from the pure white clouds hovering over the shore like a specially designed canopy. Dari Nalina Gadaa Shankha Panihi – He is holding in his hand his Chakra or the Discus, Nalina or the Lotus, Gadaa or the Mace and Shankha or the Conch. These are his distinctive features! Now combining all of the above attributes, we can form an image of HIM in our mind that is vivid and graphic. “Mukunda, who is majestically seated on the banks of Milky Ocean, with the surface sand sparkling like diamonds, adorning the garland of lustrous pearls; He, who is in a joyous and ecstatic bliss with pure white clouds hovering above, raining showers of nectar. May Mukunda, who is holding the Discus (Sudharsana Chakra), Mace (Gowmodhaki Gadha), Conch (Panchajanya Sankha) and Lotus in His hands, purify and liberate us”. This is the complete image we need to build in our mind as we recite this Dhyana Shloka. 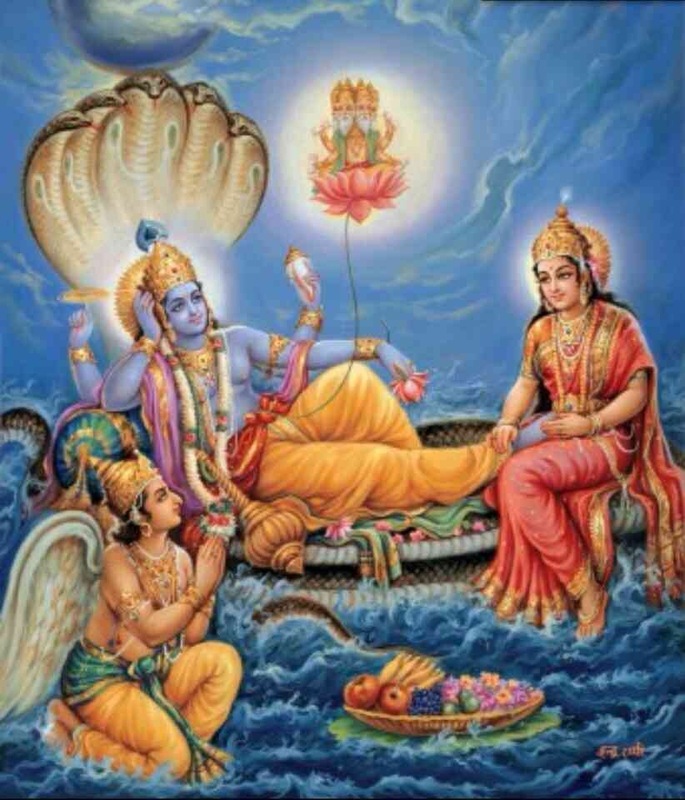 The immediate image that flashes in our mind when we hear the term ‘Milky Ocean’ is that of the nectar churning image or that of the Lord MahaVishnu in his reclining pose as portrayed in the famous Thyagaraja composition “Ksheera Sagara Shayanaa” in Devagandhaari Ragam and Adi Taalam. 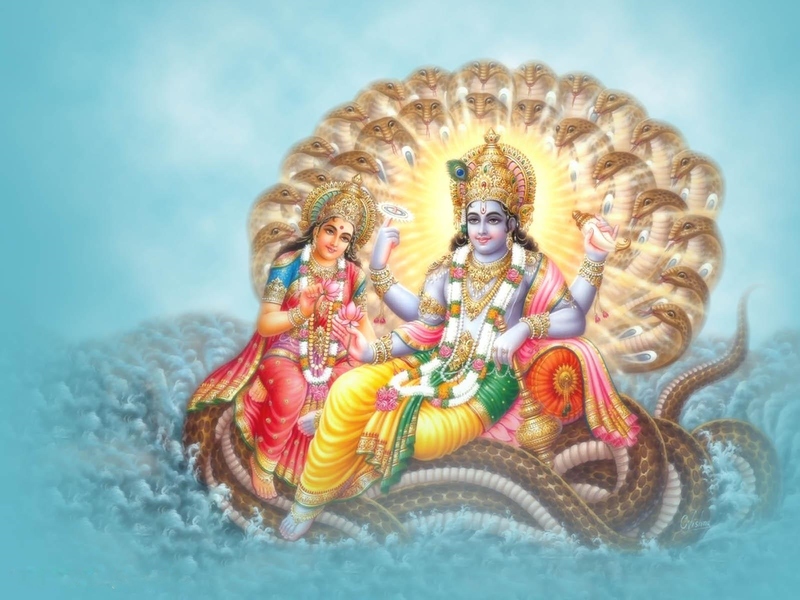 But in this Dhyana Shloka we have the image of Vishnu seated majestically on the banks of the Milky Ocean. When a man is actively engaged in the worldly affairs he does not devote sufficient time to think of Bhagavan and at that time Bhagavan is effectively sleeping. But when a man disengages himself from the world and embarks on worship, Bhagavan wakes up and the world (distraction) in him is put to sleep. When we are about to focus our mind on the Absolute and away from the worldly affairs, God is activated and the world (distraction) is deactivated. That is why we find him “Aasanastha” seated and awake and ready to grant our wish for purification. In essence with the Dhyana Shlokas we are preparing ourselves to focus our mind on the Lord and ready to awaken our ‘Chit’ or Consciousness through worship and in the process put the world (or the distraction) in us to sleep. The recitation helps to awaken ourselves and be ready to accept his grace by purifying our mind as we engage our thoughts on HIM, who will finally liberate us (moksa isyami ma sucah – BG 18.66). Chitram ramramyate tam tribhuvana-vapusham Vishnum Isham namaami. In this Shloka we picturise Him in His cosmic form or Vishwaroopam. The entire Universe is contained in Him. The basic nucleus of this Shloka is ‘Vishnum Isham Namaami’ meaning ‘I worship Lord Vishnu’. The rest of the words describe how the various parts of the Universe relate to the various parts of Vishnu. ‘Antastham yasya Vishvam’ – The whole Universe resides in him. Sura-nara-khaga-gandharva-daityaihi Chitram ramramyate – The Universe, which is the delightful playing ground of myriads of diverse life forms such as Devas, Humans, Birds, Animals, Snakes, Gandharvas and Demons. ‘Chitram ramramyate’ is a particularly beautiful construction with the threefold repetition of ‘Ram’. And finally ‘Tribhuvana Vapusham’ meaning ‘He is the embodiment of the three worlds’. Arjuna witnessed, in the Supreme Deity, the whole Universe with its manifold divisions, condensed into one place. Contemplation of the Dhyana Shloka 2 with full understanding gives us the same experience as Arjuna had that day. Some of the cosmic representations in this Shloka are also described in the same way in Purusha Suktam, expounding the connection of Purusha or the Viraat Purusha with the Universe. ‘Dishas Shrotraat’ meaning the directions were born out of His ears. Having evoked His Regal Splendour in Shloka 1 and His Cosmic Splendour in Shloka 2 in this Part, we will move on to the other Dhyana Shlokas in our subsequent Parts. Great. I bow my head before u.
Hari Om! Thank you for your kind words. God bless you! Dear Sir, For long, I have been searching the correct meanings of Dhyana slokams so that I can visualise the Bhagavat Swarupam while chanting Dhyana slokams. I cannot thank you enough for fulfilling my wish. I am so grateful. Just came across your site. Thank you for putting the subject, predicate and object in this format for it allows me to appreciate the poetic magic of this Vedantic Gem. These 2 dhyana slokas are time taking because i can’t take my mind off from them. Amazing work by Sridhar and Balaji garu. Thank you very much. Could you post word by word meaning please for the initial slokas? I loved the explanations. It would be helpful if the reference slokas are in Sanskrit script so that we get the pronunciation right. Thank you. I have added the Sanskrit Stotrams in later commentaries. Will do for the earlier ones too. God bless you! Hari Om!!! Isn’t it wonderful that what we did 3 years ago is still eliciting responses from the followers! Thank you for the clear explanation! These 2 verses were the most difficult for me…with the meaning explained I am now able to recite these! Thank you Nalini! Glad you liked it! God bless you! Hari Om!!! Thank you for the clear explanation! Thank you Nalini! God bless you! Hari Om!!! Ive always been in awe while chanting this and understood some words.your page coherently says what it means wonderful work ! Brings tears to my eyes. Thank you!!! I am please that it resonates with you!!! Hari Om! God bless you!!! DEAR SIR, I HAVE VIEWED FULL DHYANAM SHLOKAM IT IS SO NICE TO UNDESTAND IT EASILY AND QUICKLY FOR A COMMON MAN AND VERY WELL EXPLAINED I HOPE THIS WILL ENDEAVOUR WITH FULL DEVOTION AND BHAKTHI CULT IF YOU CONTINUE FOR THE FULL PARTS IN AN IN CHRONOLOGICALLY INDEXED FORM OF BOOK SIR IT IS MORE HELPFUL AND EASY TO CARRY THE BOOK TO THE SPIRITUAL DISCOURSES. THANKING YOU IN ANTICIPATION,YOURS SINCERELY.(B.K.RAMADAS.) BINDIGANAVILE KRISHNA IYENGAR RAMADAS. ADIEN…. Thank you very much for your Bhagavat and Bagavata Kainkaryam in this forum. Great explanation of Dyana Slokum 1 and 2. Have you posted an explanation on the other Dyana slokums and if so how do I Access them? Thanks again for your service. Namaskarams Ranga Krishnaswamy ji! You can access all the previous posts if you scroll down the page, on the right side of the blog you will find links to all the previous issues. Alternatively, at the bottom of each blog, it allows you to go to the previous or the next issue. thank u very much may lord vishnu shower his blessings on both of u and your families . Thank you for your very kind and generous comments. At present, we are doing one Shloka a week and hence it will take some time before we complete the whole Sahasranamam. So far we have completed 104 names, which is just about 10%! I intend to publish it in both book and audio book CD form once we have done enough number of shlokas and release it in volumes. I will send you a copy when we reach that stage. Hari Om. Thanks a lot for your kind comments. Though I know a bit of Sanskrit the real action force behind the Blog is that of Sridhar. He has the explosive energy of a supernova and the technical wizardry of a whizz-kid! We learn Vedas by rote and recite/chant by knowing or not the meaning of them. Whatever may be the case, one who chants with devotion undoubtedly reaps the benefit. I am very happy that my dear friend Shri. E.R. Balaji, a scholar in Sanskrit, a scientist turned in to insurance profession is doing a wonderful job by co-authoring this divine work. 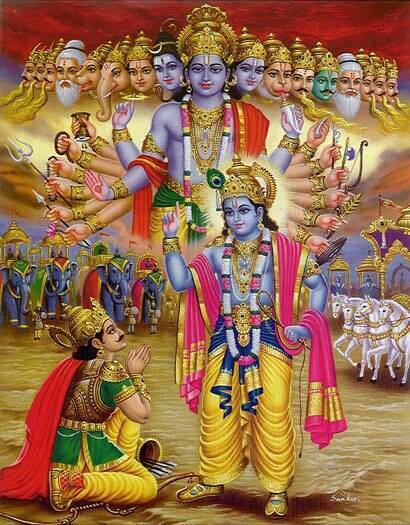 Let The Lord Narayana bless us all. Thank you Dr 🙂 Indeed Shri Balaji is doing a great service and his proficiency in Sanksrit is a great asset! 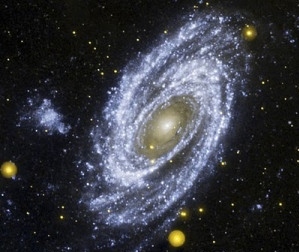 the cosmic form is so exciting to visualise. thanks for the post. Yes indeed Karthik! I wish if we can get an artist to bring it to a visual form! That would be a treat!! Thanks for a lucid explanation! Very well explained. Om Namo Bhagavathe Vasudevaaya! !